Many successful people talk about the law of attraction and the ways of capitalizing on that to attract—as a magnet would—the positive things that they have always wanted to have. You can use the law of attraction to your advantage as well; there are different practices that activate it, such as acting toward the life you want and meditating, to cite two. “Acting toward the life you want is an effective way of strengthening your action and building your sense of self,” claims psychotherapist and author of “Creating Magic in Midlife,” Karla Freeman. It’s important to believe that you will become what you wish to become, and display the ability to actually become that person. Meditation, on the other hand, creates mind clarity. It frees you of worries and reinforces that inner voice that reminds you that anything is possible as long as you believe. Meditation can restructure the way you think and behave; it can help you focus better so you have an organized approach toward the things that you want to attract. It can also keep you positive that what you send out to the universe—such as joy, hope, love, gratitude, or abundance—is reciprocated. 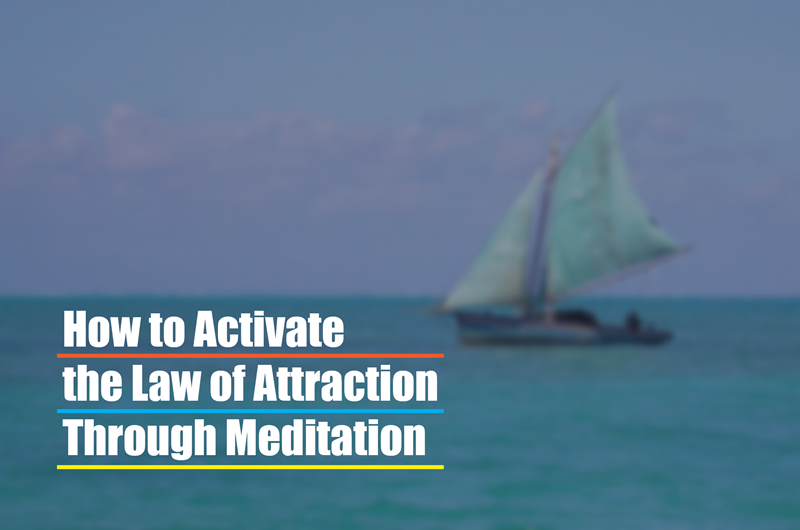 Activating the law of attraction through meditation to find love. Among the positive things that using the law of attraction can yield are love and meaningful relationships. Meditation can help immensely with this goal because spending time to just focus on yourself is a fantastic way to improve your sense of well-being and self-worth. When you’re physically and mentally healthy, you have stronger positive energy that others can feed off of, and that energy can then inspire them to demonstrate the same positivity toward you. Also, when you reinforce your self-worth through constant reminders of your good attributes, you’ll find yourself displaying these more, overshadowing your self-doubt as well as the negative thoughts you project people to have of you. It’s worth mentioning as well that meditation can simply make you a much more fun person to have around. Since this practice is known to diminish stress, enhance mood, and even beautify, naturally, there are good physical results to this that others respond to. Additionally, meditation can keep you mindful—you’re not carelessly reactive and prone to say things that may hurt other people’s feelings. Just think about it—people who are always happy, grateful and positive tend to have friends who constantly want them around, while the surly ones with toxic attitudes are typically avoided, even by the people who care about them, because the toxic individuals tend to want others to share their misery. Therefore, if you wish to attract love and meaningful relationships, let meditation help you work on yourself so you can give the love you want to receive.